Harwin has announced the introduction of a new female contact for its Datamate connectors that enables significant increases in power delivery levels to be realised. Utilising a unique, proprietary 6-finger design which is machined from a single piece of beryllium copper, the T-contact raises the current capacity on compact 2 mm pitch interconnection systems, with up to 8,5 A per contact being supported. The patented design employed in these components presents more contact points, which thereby enhances their resilience to shock (100 G) and vibrational forces (40 G for 6 hours – 2 hours on each axis). 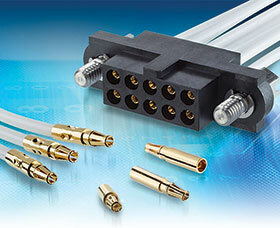 The crimp barrels accept #22 AWG wire and comply with IPC-A-620 cable harnessing specifications. The contacts are also gold plated in order to ensure that reliable performance is maintained in even the most demanding of application environments (allowing US military requirements to be met, for example). It also means that a far greater number of mating cycles (up to 1000) can be undertaken, thereby extending the operation lifespan of connectors into which they are incorporated. Their operational temperature range spans from -55°C to +125°C. The T-contact exhibits 60% greater contact wipe compared to existing Datamate contacts – which improves the self-cleaning action and reduces the possibility of surface contamination arising. To accompany these contacts, Harwin supplies a variety of dual-row housings with different jackscrews which are available direct from stock in a broad range of different sizes, from 4- to 50-position options. Among their main target applications are defence, avionics (control systems, radar, UAVs, etc. ), motorsport (navigation systems, sensors, telemetry equipment), industrial automation (drives/controls, robotics, motion control systems) and satellites.